Designer Kevin Stewart previewed his Roger Charles New York Spring 2012 shirts from "The Open Range Collection" last Friday afternoon at our wonderful friend and colleague Karin Kohlberg's Flower District photography studio. 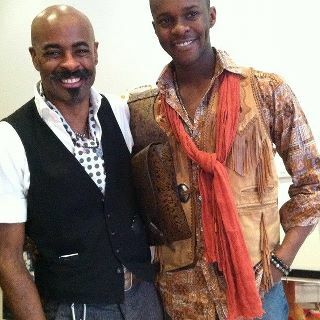 Kevin, one of my dearest and longest fashion friends since my days at DNR + his at Details, is seen above with one of his models wearing a patchwork-effect print shirt and a vintage western vest that could have been the whole kick off to this new collection. Roger Charles is made of pure 100% cotton, and hand-crafted by American workers here at home in the USA. The collection is available March 15th at Roger Charles New York. The "Open Range" shirts, colors + patterns are inspired by historic Americana heartland, up for sale online starting this March. As Kevin say, "This is a personal collection," noting he "reached into my ancestral DNA to create this new collection," with color, fabric and patterns speaking to a native narrative. "Spring brings to mind the blood red sky of a dusk or dawn...the plains, a big sky, landscapes untouched." Kevin styled all his models with Miracle Icons' uniquely spiritual necklaces and bracelets from designer Mary Jo Pane, below with Kevin. Mary Jo's design premise involves taking the jewelry she wore as a child (yes, she was/is Catholic! ), re-creating them in vintage metals. She sells at Barneys, other luxury boutiques and online. The intricately tooled saddlebag accoutrement worn/held below by model Lincoln Harding was created by leather craftsman Velma Q. Newsome, below right, for her collection Prodigy. Detail of the western vest, Kevin's own killer accessory for the presentation. The ever-stylin' Kevin Stewart -- explaining the details and concept of his Americana-inspired, American-made shirt collection.